Those tender pink stems are so very tactile. Is it the vibrant colour after a long grey winter and the promise of spring warmth ahead? Or the contrast of tempting ruby stems against almost fluorescent leaves, which have been starved of daylight and are eager to escape the forcing pot. 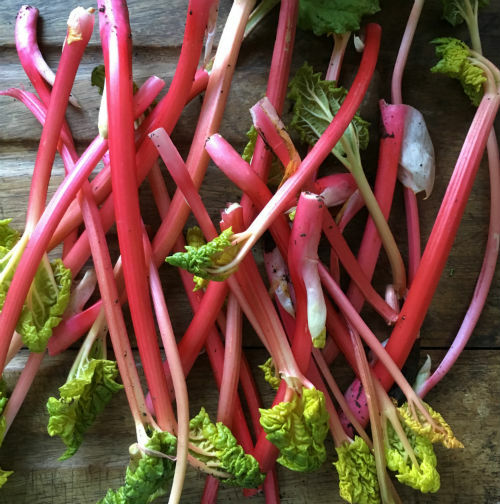 I just love rhubarb, whether it be gently poached inside the AGA roasting oven with a generous splash of a freshly squeezed blood orange or cooked with the very last of our cloudy, home pressed apple juice. Chop stems into equal pieces and poach uncovered in a non-metallic dish with a couple of tablespoons of ginger cordial. Take care to not to over cook the rhubarb, but if you do, simply blend with whipped cream, Greek style yoghurt and top with some finely chopped stem ginger for simple fruit fool. Sweat a couple of finely chopped shallots until soft but not coloured. Add a teaspoon of light soft brown sugar and continue cooking for a minute or so, stirring all the time. Add a couple of teaspoons of red wine vinegar and a couple of finely chopped sticks of rhubarb. Cook until the rhubarb is soft. Allow to cool and then blitz with a generous bunch of garden mint. Season and serve with roast lamb. Or cook a couple of stems until very soft with a heaped teaspoon of soft light brown sugar and the juice of a whole lemon. Finish with a dash of chilli oil to serve with pan fried mackerel and watercress salad. If you have rhubarb aplenty then consider making a simple homegrown garden conserve. Simply chop 450g rhubarb and add to a large stainless steel pan or maslin with 450g granulated cane sugar with the juice of one lemon along with four rose-scented geranium leaves. Allow to stand for an hour or so. This draws the moisture from the rhubarb and there is no need to add any water. Place pan over gentle heat and stir to ensure all sugar is dissolved. Then increase temperature, bring to a boil and continue cooking until reaching setting point. Remove the leaves, pot the conserve and seal. Omit the cooking apples in the recipe for our Dorset Apple cake and use rhubarb instead. Or chop the rhubarb in very fine slices and add raw to scones instead of dried fruit. Make a compote to serve with pancakes, porridge or try your hand at making homemade yogurt and serve for breakfast or brunch. Add a handful of toasted hazelnuts or chopped pistachios to serve. It’s no coincidence that our free range hens have increased production now that the days are lengthening. Treat yourself to a rich and creamy custard, fill a tart or if time allows make some ice-cream and fold in some poached rhubarb just before you begin the freezing process.